Aziz Sayyed being escorted to the Madison County Courthouse in July 2017. A north Alabama man pleaded guilty to terrorism charges yesterday, admitting he bought bomb-making materials and had hoped to conduct terrorist attacks. In federal court in Birmingham, Aziz Sayyed, 23, of Huntsville, entered the guilty plea to charges that he sought to aid a foreign terrorist organization. Federal prosecutors say after watching videos from the Islamic State terrorist group, Sayyed purchased ingredients to make an explosive and told others about his hope to use it in a car bomb or explosive belt. Sayyed also shared the videos and expressed his support for the Islamic State and terrorist attacks. 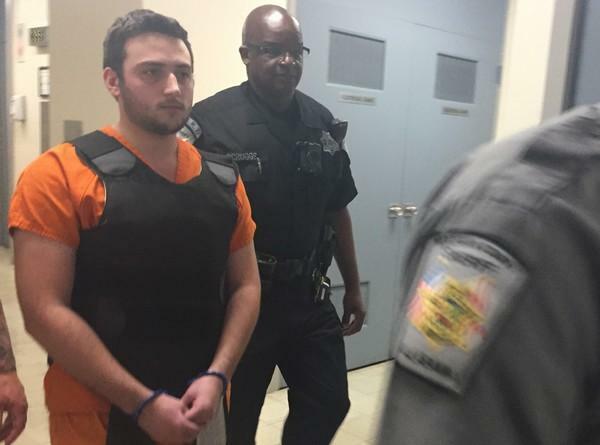 According to the plea agreement, Sayyed told people he wanted to attack police stations or the Redstone Arsenal military installation in Huntsville. He was arrested after discussing his plans with an undercover FBI agent in June. Sayyed's plea agreement stipulates a 15-year prison sentence. He is scheduled to be sentenced in June. U.S. Attorney Jay E. Town says a tip led to the investigation and arrest. Town released a statement saying "Sayyed was brought to our attention because citizens saw something, so they said something. If we are to keep our cities safe, no matter the type of suspicious activity, our community must play an active role."